This week we have a special piece to post. During the previous month our course has had the privilege to participate in a workshop held at the Whitechapel Gallery, given by Annette Loeseke, on her research involving visitors’ reception and interpretation of an event, and how the exhibition layout can affect this. Having been able to carry out similar studies with other institutions as the British Museum, and the Shanghai Museum, we were all interested to observe what findings the Whitechapel Gallery would reveal. This blog report summarises findings of a workshop on Visitor Research and Curating at the Whitechapel Gallery during the week of October 21. Students of the MA Curating the Contemporary conducted the research and collected data in the gallery. Many thanks to everybody who participated in the workshop and to all the Whitechapel Gallery staff who supported us!! The workshop aimed to present a reception-centered approach to curating, and intended to show how exhibition concept, design and space layout influence visitors’ reception and interpretation. Building on empirical insight into reception as process and practice I argued that curating and exhibition design should, to a greater extent, respond to actual reception practice and visitor behaviour in the exhibition. For our study, we considered the following exhibitions: “Sarah Lucas: SITUATION Absolute Beach Man Rubble” on ground floor and first floor, Giuseppe Penone’s installation on ground floor, two small video rooms on first floor (“Artists in Residence: Annette Krauss: Hidden Curriculum/In Search of the Missing Lesson”), and a one-room-exhibition on the “Contemporary Art Society: Nothing Beautiful Unless Useful” on first floor. Within two days of data collection we conducted 45 structured face-to-face interviews and 59 tracking studies. Interviews were conducted with randomly selected visitors who had finished their visit to the gallery. Tracking studies were used to observe visitor behaviour in the exhibition rooms. Visitors were selected at random when entering the room and followed on their path through the whole building. We noted visitors’ path and took notes when visitors stopped in front of single displayed items, measuring the time in seconds they spent watching these items. As data were collected on only two consecutive days, findings are not to be understood as representative or conclusive. The study was designed as part of a workshop and carried out as qualitative research to generate hypotheses for further research and discussion. As collected data indicates, visitors tend to pass through the exhibition rooms without stopping and staying in front of most displayed items. This might be due to exhibition topic as well as exhibition design: Many paintings, photographs, sculptures and installations were displayed all over the room. Hot spots can be found on the left and right walls and corners: It seems as if visitors tend to walk alongside of walls, rather avoiding the centre of the exhibition room. Overall, visitors do not often stop and stay in front of items except for those containing text to read such as newspaper ads for example. For these heat maps, we counted visitors who approached the displayed items, without measuring the time they spent watching the items. Visitors tend to enter the exhibition on the left and stay longer in the areas close to walls, on both the left and right hand side (see second map below). 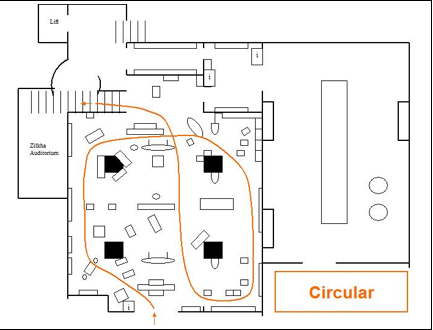 Visitors who followed such a “circular”pattern entered on the left hand side, walked alongside of the left wall, continued walking down the right wall, then crossed the room to take the stairs to the 1st floor. Following a significantly different movement pattern, these visitors entered on the left hand side as well, walked alongside of the left wall, then crossed the room before walking up again alongside of the wall on the right hand side and leaving the room. Considering the complicated exhibition design, displaying many items in each room, especially in gallery room 1, one could assume that paths through the exhibition were highly individual. Instead, we were able to identify four distinct movement patterns. Although findings are not representative, data indicate that exhibition design might impact on visitor behaviour and reception to a certain extent. Nevertheless, visitors seem to follow certain general movement patterns, regardless of the specific exhibition design. Data indicates that environment, space layout and exhibition design – the specific format of an exhibition – have major impacts on how visitors receive and interpret exhibits and exhibitional contexts. 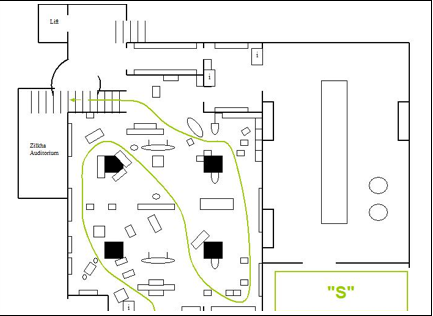 Non-cognitive aspects such as visual impression, visual orientation and orientation in space do influence visitors’ reception and interpretation. We therefore need to develop reception- and process-oriented exhibition models refering to reception practices by contemporary audiences: The reception process as well as distinct reception style types need closer examination. Systematic experimental visitor studies and comparative research are needed to further analyse non-cognitive dimensions of reception process and practices. Experimental curating is needed to systematically create different settings and designs and test them against visitors’ experiences and engagement. Exhibitions should not only build on content, but integrate ‘dramaturgical’ elements, supporting visitors structure their reception process in different ways.